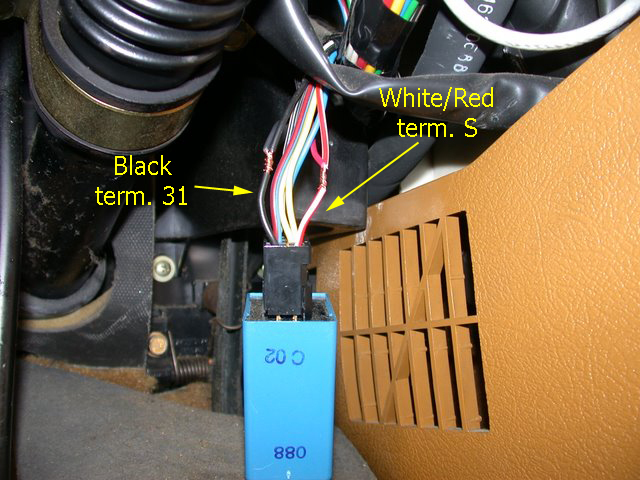 The factory or dealer installed voltmeter gets connected to ignition-switched fuse 13 -- working only when the key is in KP-II, where it is normally when the motor is running. 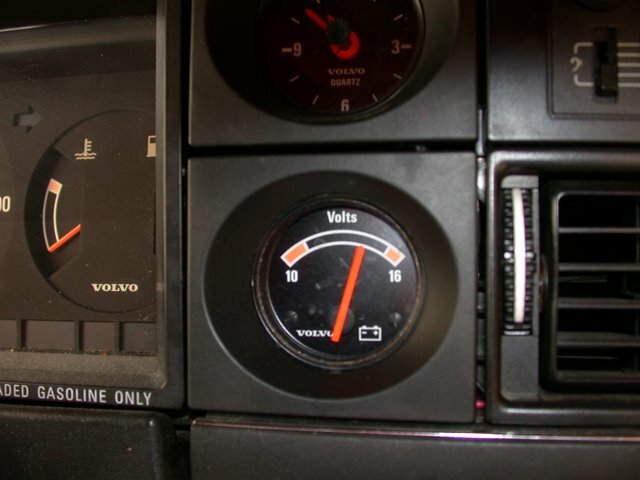 I prefer to have the voltmeter available before, during, and after cranking, but this expanded-scale volt gauge uses about 0.05 amps -- too much to just leave on the battery. The 200 ignition switch provides a terminal "S" that is connected to battery whenever the key is in the lock. On our earlier 200's ('83 and '84 for example) this terminal was conveniently available on fuse 4. 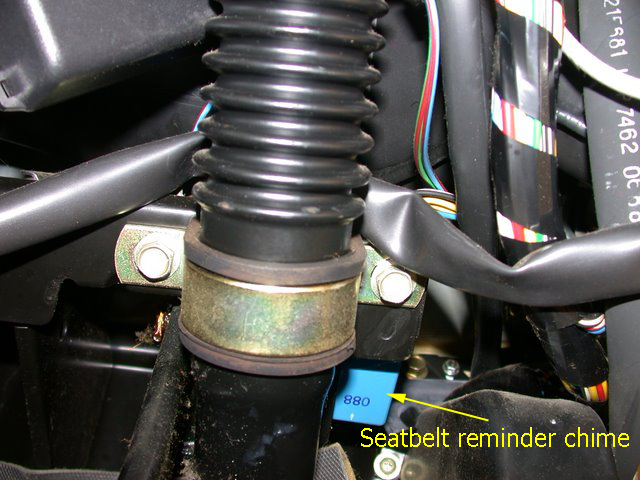 The wiring changed, and the later models run terminal S directly to the seat belt/key reminder chime. This is great news for simplicity and speed to install, and that is the other "why" for my approach. Only two wires are required assuming we don't leave our keys in the ignition switch, the added 0.1A drain from the gauge illumination is acceptable. 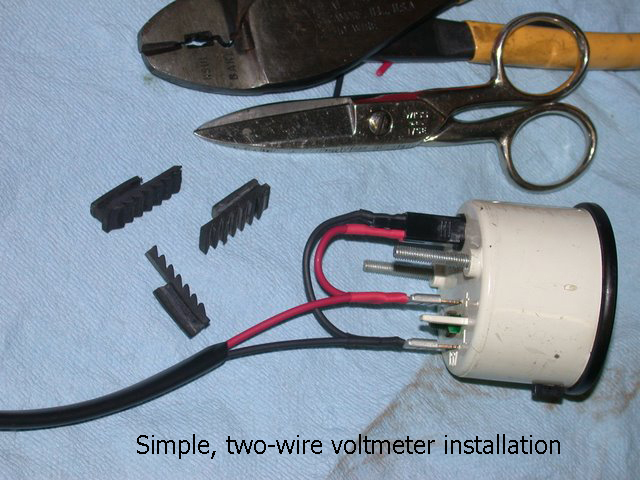 I prepared the voltmeter with about 24" of 20-gauge wire. These accessory gauges never needed dimming, in my opinion, so the light is run in tandem. Then, I pulled down the knee pad (airbag cars will have the bolster) and located the chime in the blue box. The clock is slipped into the dash using the rubber spacers, in this case, below the small clock already occupying the upper slot. Its wiring is connected to the black and white/red wires that go to the chime. You can splice your favorite way, Scotchlocks, solder, whatever. I am fine with splitting the strands and wrapping with the piggyback lead, and then using vinyl electrical tape to insulate the splice. The advantage is the load we are tapping does not consume much, meaning voltage drop is negligible, and its source is the ignition switch -- the point of distribution for all the vital electrical needs of the car beyond cranking. Now I can see the battery any time the key is in. And wiring the gauge and light couldn't have been simpler.